Our first day’s experience with icebergs was amazing. We spent a full day in the Tracy Inlet, visiting both of the forks at its head (cleverly named North Tracy Arm & South Tracy Arm). This inlet is roughly 25 miles long and was carved out by the Sawyer glacier. It’s very deep, with nowhere shallow enough (or protected enough from floating ice) to anchor, so we spent the night before in a largish cove at the mouth and got up early to spend the entire day motoring up to the glaciers and back. Between the waterfalls, icebergs & glaciers, the scenery was so spectacular that we were all exhilarated after our day and not at all exhausted like most long days with the engine running. When we started out, there were a few large icebergs in sight and we were nervous about maneuvering near them and getting too close. We kept someone on the bow continuously watching for floating ice, and communicating by walkie-talkie with the person at the helm which pieces looked most worrisome. As the day progressed, we learned more about them and became more confident in ourselves and our boat. The ice ranges in size from huge icebergs, many the size of an automobile or even slightly larger, and on down to tiny ice-cubes. Those in the know call the small-to-midsize pieces “bergie bits”. The smallest pieces melt away more quickly because of the larger amount of surface area, so you mostly see only really big bergs once you get several miles away from the actual glacier and as you get closer the sizes vary more. Ice is less dense than water, which is why it floats, but it’s not a *lot* less, so it floats low in the water. There is a lot more under the surface than above, which is scary to anyone navigating a small boat nearby. You don’t want to get too close and hit something hard with a lot of inertia! We had seen photos of people in small boats using pike poles to fend off the ice. Kathy played around with our pole a bit, pushing at a few mid-size chunks, but we soon decided that this was unnecessary. We traveled slowly (1-5 knots, depending on how “crowded” it was) and the ice traveled even slower! But we did appreciate having a concrete hull nonetheless! We were surprised at how much the ice varies in color. Some pieces look white, some look clear, some blue and some black. The blue ones apparently are the densest, from low down in the glacier where all air bubbles have been squeezed out. The black ones are from somewhere along the glacicer’s edge, where it was able to accumulate dust or rock particles. A few times we were confused by these guys, thinking that there was an uncharted rock in our path – only to realize that it was floating along with the rest of the ice! The ice melts away forming crazy shapes, with lots of curves and protrusions that defy description. Like cloud-watching, it’s easy to invent fun names for the characters passing by, but they change significantly as your angle of view changes. Sometimes it melts unevenly in such a way that the whole berg then becomes imbalanced and it can roll without warning. Since you don’t know what it’s shaped like down below, you don’t know what’s going to come up! We enjoyed a beautiful cruise up the inlet, seeing waterfalls and dramatic cliffs. The floating ice thickens over the last few miles until you’re so focussed on charting a course that you’re no longer noticing the land. 🙂 At the end of each arm is a section of the glacier, coming right down to the water in both cases. Although it varies over time, we couldn’t get any closer to the South Arm than a few miles, and the North Arm was clear enough that we could work our way as close to the face of the glacier as one would dare (in our case it was about a quarter of a mile. We turned off the motor and just floated for about 45 minutes. There were 4 or 5 other boats in the inlet on the same day as us, a few private motor-boats and a few charter adventure tours. 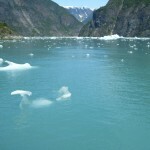 One of the tour boats launched a dinghy with 3 or 4 people, who went up quite close to the face of the glacier. The face of the glacier must have been 250 feet, a quarter mile wide, and we have no idea how long it was coming down the valley! We felt like tiny specks floating in front of it. After a couple of the other boats left, and we were thinking about getting moving again, we started to notice a few bits of ice falling into the water. We were enjoying hearing the cracks and splashes, when a huge chunk calved. It looked like the whole cliff wall was falling, although it was in fact a pretty small part of the total face. It created a giant wave which rocked everyone in the bay. We were all a little worried that we were going to go for a real ride, but by the time it got out to us it was only a couple of feet tall. Kathy happened to catch this in a movie from our camera. See link below! We left shortly afterwards, carrying with us the awestruck sense of having witnessed Mother Nature at work. This glacier is retreating, and it was curious to note that our GPS showed us being in the middle of the glacier on our navigation chart. 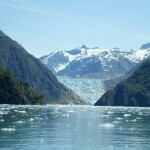 Next we head to Juneau, in preparation for our visit to Glacier Bay National Park. Hi Dan & Kathy. Your former colleague and also boat neighbors from Tomahawk bay (AJ & Maria) are finally gettting close to moving our boat north….a little late, we’re afraid. We will be heading down the Columbia River and may be passing by your way on Sept 8, possibly even for an overnight. What is the best way to contact you these days? What’s the news from Scappoose?